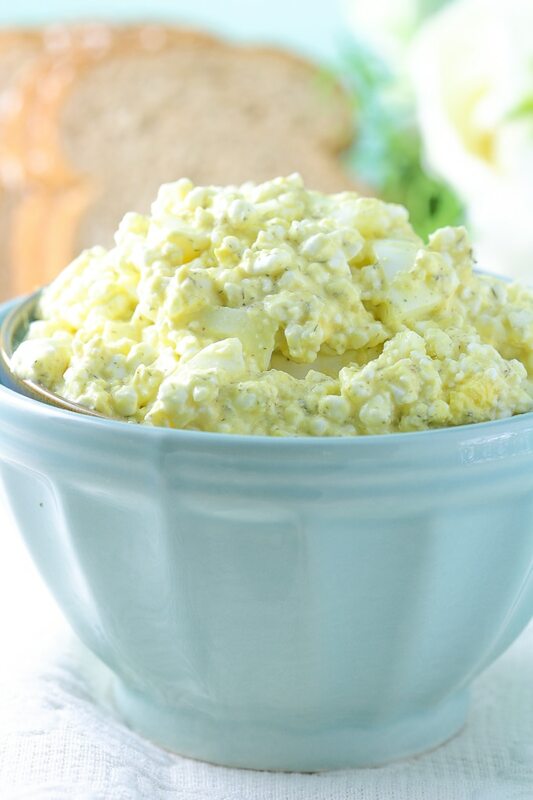 You won’t miss the mayo in this protein-packed Cottage Cheese Egg Salad recipe. But over the years I’ve had a love/hate relationship with cottage cheese. I’m fairly simple that way. Egg salad on the other hand? It will forever own my heart. I recently discovered (out of necessity, more than anything else, when I realized I was running low on eggs) that you could mix these two protein powerhouses together to create a satisfyingly tasty batch of egg salad. Stuffed between two pieces of hearty whole-grain bread, this egg salad makes the kind of lunch I could eat day after day. Okay, well, maybe that last part’s a stretch, but chives + egg salad is sandwich perfection. Trust me. Give this quick and easy recipe a try the next time you’re looking for a filling lunch option! 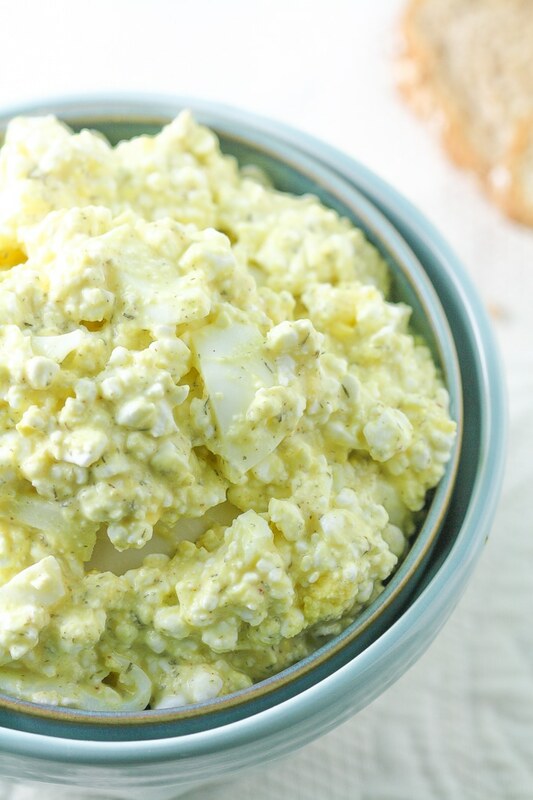 You won’t miss the mayo in this protein packed Cottage Cheese Egg Salad recipe. *A thicker cottage cheese works best here. I highly recommend using Friendship Dairies if it’s available in your area. If yours contains more liquid, let it drain in a fine sieve before mixing. Many years ago, (in the 70’s or 80’s), I needed to lose some weight, so I followed the Scarsdale Diet. It’s a simple, easy, plan, wherein you have a daily menu all laid out for you. On one of the days, lunch includes 2 eggs and cottage cheese, a slice of plain toast, and a couple of other things. 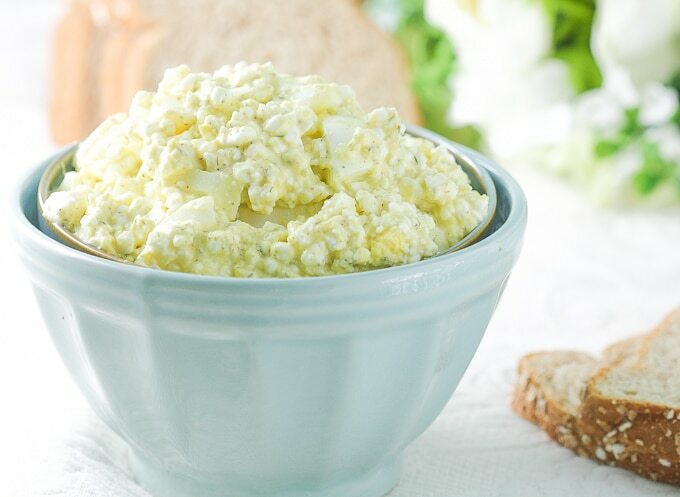 Since I love egg salad, I did what you did, and made it with the cottage cheese! It’s actually pretty good, too. Re: the dill and mustard: when I make potato salad, I always grate one or two dill pickles into it, plus a healthy dose of prepared mustard…delicious! Hmmmm…I wonder how potato salad would taste with cottage cheese? Oh, I bet it would be good! And what a nice protein boost for an otherwise carb-heavy side dish. My husband likes potato salad so much, I swear he’d eat it as an entree. If it had cottage cheese in it, maybe it’d be a main dish ha! I’ve never grated pickle into my potato salad, but I love that idea. Usually, I just use salad cube pickles, but they’re often too sweet. Your idea sounds yummier! I had the gastric sleeve surgery in July and I’m looking for high protein menus. I tried this for my lunch today and it’s a keeper! Thank you.